In January 1944 Miss E.M. Fox of Beckenham, Kent donated 20 Australian birds to the Royal Albert Memorial Museum in Exeter. We don’t know why she had these specimens. They were collected on the first expedition ever to cross Australia – the First Leichhardt Expedition. The expedition party travelled across unexplored country between the Moreton Bay area (Brisbane) and the far north coast of Australia. They named many geographical features on the way, such as the Peak Range, Valley of Lagoons, Dawson Valley, and the Burdekin and Gilbert Rivers. The birds are from the collection of the youngest member of the expedition, John Murphy, who was only 16. He was a good shot, and was taught how to preserve the birds he collected by the expedition’s ornithologist, John Gilbert. Some of the birds are well prepared (Gilbert) and others a bit rough (Murphy). 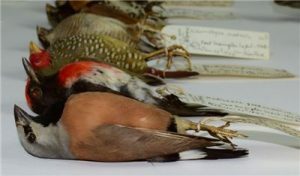 Three are potentially type specimens (the standards on which a species is based; specimens used for scientific descriptions published later on by Gilbert’s employer, John Gould). Several, such as the Plains Wanderer and the Star Finch, are rare species no longer found in the areas Murphy and Gilbert collected them in. All 20 birds are of very high scientific and historical importance. John Gilbert’s rather larger collection of birds from the expedition also found its way back to England, but was subsequently split up. Specimens have been found in museums in Philadelphia, New York, Camarillo (California), Liverpool, London and Leiden (The Netherlands). At least two specimens returned to Australia and are now in the Museum Victoria, Melbourne. Further details can be found on the National Museums Liverpool website.